So on this day one hundred years ago the Titanic went down, a tragedy on a grand scale. There is something about the Titanic’s sinking: the tales of heroism, the astonishing survival of some of the folk and the eyewitness reporting that makes it one of those events that we all want to hear more about. I think there is a part of us that wishes there was a happy ending to the tale. But the reality is that hundreds of people died that cold night because of bad planning, really. They were ill-prepared because so many believed that the ship was unsinkable. Folk were lulled into believing that they were secure against the elements and that this ship was really the pinnacle of man’s engineering, manufacturing and technological achievements. Quite literally they believed they were unsinkable. I have a feeling that those folk that boarded the Titanic were confident that they would be arriving in New York within a couple of days. Unfortunately things didn’t turn out as planned. In fact I am sure that when most folk got on the ship they were headed for the trip of a lifetime and they weren’t thinking about their mortality at all. Honestly, it is quite a sobering thought… it didn’t matter wether you were a first class passenger or a third class passenger, no one got to say “How good they had been” or “How many wonderful acts of kindness they had performed…” the ocean was not discerning. This weeks Giveaway is a children’s chapter book, and an intriguing mystery, that takes place on the Titanic. Remember the story of the Titanic is a tragic one and there will be a couple of tears shed along the way. Let me just say gripping stuff. We started reading this book on Friday and we whizzed through it this weekend… with pleas of “read, read… read” every time I paused for breath. This is a mystery story that had us gripped… The story of two children, Chrissie and Luke, whose distant Aunt rescues them and promises them a new life in America, after their mother dies. She convinces their father to let them travel with her… once on board ship a number of clues point to the fact that she may not have such good intentions… On board ship they make friends with another family who are traveling to America to try and get medical help for their sickly baby. “Tear warning,” the baby dies shortly after leaving England. Chrissie and Luke also make firm friends with a young girl, Grace, whose father is a missionary. After the baby dies he has a discussion with the children as to where do we go when we die… and how do they know that their baby went to heaven. We are introduced to “all-things Titanic” as a ships steward takes the children and their friends on a top-to-bottom tour of the ship. We went to bed to-night with a chapter to go and the band is playing on the deck… The question is will the children have time to solve the mystery surrounding their peculiar aunt before the ship sinks and worse will they survive… Will they get a chance to get the help they need from Grace’s kind father? Will he survive since only women and children were meant to get into life-boats. So many questions remain open, with so few pages left to go!!! We are gripped and I know I am going to be woken early for the last chapter in the morning. The National Maritime Museum of Northern Island also has a great Titanic page – filled with thing to look at… really good!!! They also have a downloadable education resource (pdf). KidsKonnect has lots of lovely links, facts and little known information. 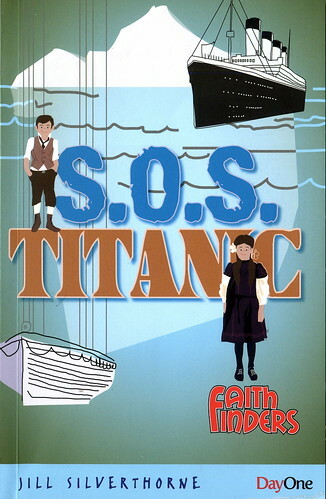 Make your own Titanic movie… Using clips… from history and exploring the wreck… very fun. This GiveAway works in the usual way, comment before the end of this coming Sunday, 22 April 2012, and we will draw and publish the winners next week! – I won’t respond to your comments as I do on our other posts because I don’t want to be included in our own giveaway. Wow! We’d love that book, especially my mystery lovers. Thanks for offering it! Sounds like a great read. Count us in! Sounds like a great story! Please enter us in the give away. Well, goodness, after that cliffhanger of an ending, I am definitely in on the draw…and if I don’t win, will you PLEASE tell us what happened??? Have a great week! Fantastic book. Please count us in. You have such great giveaways. Sounds like a great book. I have a nephew who would love it! Well, now I’m dying to know what happened! Count us in – thanks! Sounds like a great read…count me in. Interesting story! Hope I get lucky. We’d love to read it! Sounds like a great read! Please count me in (& thanks for the chance)! A story about the titanic? Yes please! Thank you for the chance. This sound like such a good book!